Hi i`ve recently bought used SAPPHIRE NITRO+ RX 580 4Gb SKU 11265-31. Both VBIOS are tweaked probably for cryptomining. When on switch position 2 (closer to HDMI - i presume silent mode boost clock is set to 1200Mhz), when switch is on position 1 (farther from HDMI) screen is distored and flicked and basically unusable.This are screenshot from GPU-Z and VBIOS i i bios file uploaded to techpowerup. My question is , is it safe to flash VBIOS with these to files provided on VGA bios collection? I see that Device and sybsystem ID are matched but Memory is different, its Samsung, on stock BIOS on VGA collection is Elpida, Hynix. One more question, when the Windows is powered on, is it safe to change switch position, will ATIflash detect BIOS change without restarting and in that case will BIOS be flashed on that changed position? I will post both GPU-z screenshots as soon as I get back home. currently installed BIOS on switch position 1 (farther from HDMI) that is not working distorted flicker screen that freezes. They're both modded even though ones working I would hazard a guess and say even that one will crash under 3d load. No you cannot put a rom on with different vram profile. Wait until someone finds you the correct bios, I know personally there are some for your card with Samsung vram. Just hold tight for the correct bios file's. Is it worth to try asking Sapphire technical support for STOCK silent and performance ROM? No, not really, we will have the stock files here no doubt, I will have a look now as I have been busy up until now. is it possible to get a pic of the vram dies? These 2 look like stock to me going off vram timings and power limits etc. Performance bios files, all look like stock based off vram, clocks and timings. All have matching subsystem and device id that match your card as well as having samsung vram. Tnx mate, i`ll let you know the results. Cheers. I`ve managed to flash working BIOS (switch closer to HDMI) with one of performance bios you provided. But i haven`t been successful with other bios (switch farther from HDMI) with any of the provided ROM flies, i`m getting error Subsystem mismatch ID. Also ROM details on installed ROM are weird as you can see the readings from ATI flash. Have a look at that ROM which is saved and zipped. Never mind, now i have stock working BIOS. In a case something goes wrong i can re-flesh BIOS when switch is closer to HDMI using onboard GPU. Is there a possibility to force a flash and bypassing mismatch ID on obviously bricked BIOS which is on switch position farther from HDMI. 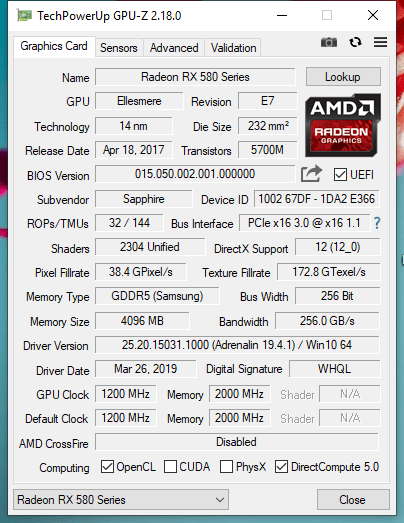 When I hit look up button on GPU-Z, program finds that Vendor ID belongs to rx580g and rx580 8gb version. What is command prompt line for ATIflash to force a BIOS flash ? I`ve managed to flashed bricked BIOS on another switch position. Hey did you get round to having a try with the cmd prompt flashing? Dual BIOS is a great thing in case that one bios is messed up. I recommending to change switch position to alternate BIOS when trying this in case something goes wrong to have at least one working. As I saw on other threads it's much more complicated to unbrick the card when none of the BIOS is working. It turned out that Nitro boost STOCK rom is already uploaded. Also already obtained as unverified. Is it possible to validate these to offical for SKU 11265-31 (Samsung memory) version of card? These two STOCK ROM (Nitroboost and SILENT) should be validated. I `ve posted made a screenshoot from Sapphire techical support as a proof. I've had the same ones direct from Sapphire myself and they were included in the oens I told you to flash, I think they can only be verified if tested by TPU and not just uploaded from anyone if that makes sense, you didnt specify if you managed to flash the 2nd bios that was giving you a mismatch error? Yeah, i did by using command prompt as admin with command line for forced flash "amdvbflash -f -p 0 name of BIOS.rom". Everything is back to factory setting: NITROBOOST VBIOS on right switch position, SILENT VBIOS on the left. that's good, you will find now in future if you ever need to flash that same bios position you can do it normally through atiflash and won't have to use cmd prompt, there was all kinds of funky going on with that bios someone had flashed on it though all id's should now match up and flash without an issue. Right, now flashing is working withoud cmd prompt. You `re right, third VBIOS that @NdMk2o1o suggested. Can we suggest to TPU that these two ROM are stock one and obtained from Sapphire technical support so when people can easily find them for this versio with Samsung memory?